Chef DeMuro has served at both Pointe Hilton Resorts since 2008 and currently oversees the inner workings of each on-site restaurant at Tapatio Cliffs. Anthony is known by his preference for locally and regionally grown ingredients, distinctive Mediterranean influence and vivid use of flavor and color. Each of these passions has intertwined to help Different Pointe of View set an excellence standard among Phoenix restaurants. For 29 years Chef DeMuro has enjoyed a rewarding and charmed career. 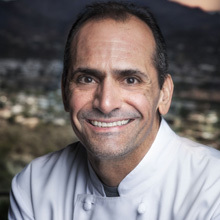 Anthony traveled from Southern California to Arizona where he served as executive chef and food and wine director at Doubletree La Posada Resort. From there he made his way to Pointe Hilton Tapatio Cliffs Resort and has since served as dual Executive Chef. Recently awarded from Arizona Republic's food critic Howard Seftel, Different Pointe of View received a "Gold" for his dish served at the Devoured Food + Wine Classic. Devoured is the region's premier annual culinary event hosted by Phoenix Art Museum, Local First Arizona and Devour Phoenix. Our goal is to showcase the fine food and drink producers and purveyors of Arizona while furthering metro Phoenix as a dining destination worthy of international prestige. Plan the Phoenix wedding or event of a lifetime at Different Pointe of View restaurant. Traci Fox, Senior Catering Manager is able to recommend florists, entertainment, photography, audio visual, ministers, specialty linens, ice carvings and anything else you might need. Additional Charges may apply. For more information, please contact Traci Fox or call 1- 602-866-6397.